The fusion welders are electric tubular heaters cast in aluminum mounted on a clampable base and they come with a control box which regulates the electric power thereby controlling the temperature. A mounting bolt, nut and washers are also provided to mount die sets on the heater. The dies are machined and aluminum castings coated with “RYTON” for easier release and come in matched sets: a female die to soften the outside of the pipe and a matching male die to soften the inside of the fitting, in nominal U.S. sizes. Individual replacement dies are available. These units are useful for both shop and field welding of Polyethylene (P.E. ), Polypropylene (P.P. ), and Polyvinylidene Fluor (P.V.D.F.) known as ‘Kynar’ or ‘Sygef’. The fusion welder CANNOT be used on PVC or ABS pipe. The pipe and the fitting should both be cleaned and the end of the pipe beveled. The pipe is inserted in the female die and the fitting over the male die. It is important that both be put on straight. After the proper heating time for the particular pipe, the pipe and the fitting should be taken out with a snapping motion and pushed together in a straight line. After each joint, the dies should be wiped off with a soft, clean rag. 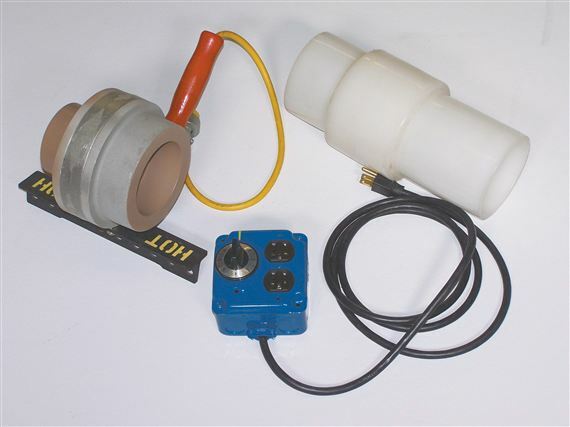 LFW1 has a diameter of 3½" and a rating of 350 watts— 120 volts and handles pipe from 1/2" to 2". Comes complete with control box, bolt handles and uses dies from 1/2" to 2"
LFW2 has a diameter of 6" and a rating of 750 watts— 120 volts and handles pipe from 3" to 4". Comes complete with control box, bolt handles and uses dies from 3" to 4".